Another February, another premium bond win! I only won £25 but by massive coincidence(? ), I also won this time last year. I’ve now won £100 in just 12 months, with only a very small premium bond holding of £2,250, beating the oft quoted 1.35% “return”. Despite recent articles like these talking about premium bonds being ‘bad investments’, I continue to buy a few more bonds each month. And I actually agree, they are rubbish investments but I see the bonds as the ‘cash under my mattress’ so to speak (except actual cash under my mattress isn’t ever going to win anything! ), not as investments – my investments are in shares, index trackers, investment trusts and p2p lending. Anyway, I think I’ll chuck my winnings at my recently depleted emergency fund. The big holiday that I’ve been putting money aside for has finally come round, so I won’t be about for a few weeks. Funnily enough, I don’t feel like I’m ready for a holiday as I don’t normally go away so early in the year (not jaded enough from work, haha!) but I’m really looking forward to catching up with the family and trying new things in a country I’ve never visited before. I don’t have any blog posts scheduled so will do some catch-up ones when I get back. 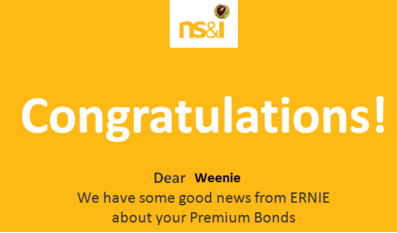 This entry was posted in Blog Update, Family, premium bonds, Savings by weenie. Bookmark the permalink. I have some premium bonds to check up on which are so old I only have paper certificates for them. I didn’t even know I owned them until my Mum gave me them a while ago! I need to fill out a form to find out about them, it would be exciting if there’d been a win (though unlikely as the total amount is very low)! If you know what your premium bond Holder’s Number is, I think you can check online for unclaimed prizes. Good luck! Thanks M – congratulations and hope all’s well with you and the newest member of your family, whom I’m sure (knowing you), has already got a Junior SIPP and JISA sorted out 😉 Yep, look forward to catching up soon! Both my wife and I had wins on the lottery this week. Me, £25 on the standard one, she £6 on the Euro millions. Like ERNIE, you gotta be in it to win it! Have a great holiday. Cheers Jim and yep, in it to win it! You have drawn my attention with this subject. I would like to hear more about premium bonds in UK. Congrats on your win – you seem to be doing far better in the PB stakes than me (and I have a larger holding!) – but like you I see this as a cash reserve / emergency fund, so it doesnt bother me, more importantly its tax free! Have an absolutely fantastic holiday, put your feet up, enjoy and relax!